Your motorcoach group or church group will love our Ozarks hospitality! Let Myrtie do the cooking when you bring your group to Eureka Springs. 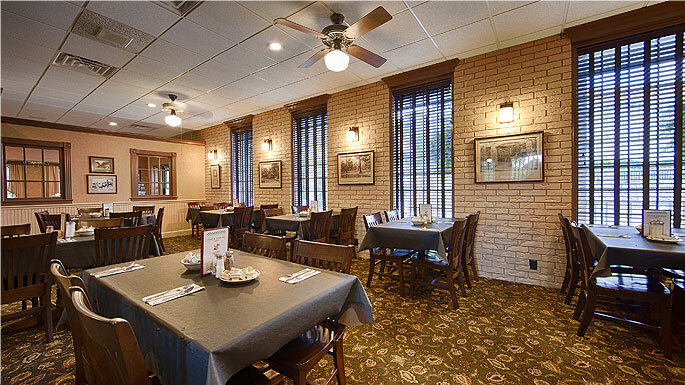 Myrtie Mae's is located conveniently inside the Best Western Inn of the Ozarks and is capable of serving groups up to 90 people in the dining room, with ample van and motorcoach parking. With our Choice of 5 group breakfast and dinner menus and bountiful salad bar, your group will leave Myrtie Mae's energized and ready to take on all the exciting sights and sounds around Eureka Springs! For group meal pricing, call one of our Sales Managers at 800-552-3785 to Try Myrtie's Cooking on for Sighs!